Saxophonist and composer Joshua Redman is joined by drummer Brian Blade, bassist Scott Colley, and trumpeter Ron Miles for Still Dreaming - an album inspired by his father Dewey Redman's 1976-1987 band, Old and New Dreams. Along with the senior Redman, Old and New Dreams featured an all-star lineup of Ornette Coleman collaborators - cornetist Don Cherry, bassist Charlie Haden, and drummer Ed Blackwell. 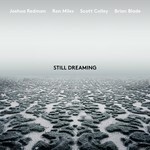 Still Dreaming features six new compositions by the new band as well as one tune by Haden and one from Coleman. Joshua Redman's first album on Nonesuch was the Grammy-nominated Momentum (2005). His other releases on the label include Back East, Compass, and Trios Live, all of which explore the trio format; MoodSwing (1994, re-issued); Walking Shadows (2013), his first recording to include an orchestral ensemble; The Bad Plus Joshua Redman (2015), a collaboration with the acclaimed trio; and Nearness (2016), a duo album with longtime friend and collaborator Brad Mehldau. "..each musician brings so much earnest conviction to the table, that feels right and just; the music wouldn't ring truthful otherwise. And it's not overstating the case to say that this framework stretches the musicians in salutary ways. When Redman begins his tenor solo a few minutes into "Blues For Charlie," his blurry vocality actually evokes Joe Lovano (a lifelong Dewey fan), without tipping into ventriloquism. On "Haze and Aspirations," a gorgeous Colley waltz, the tenor solo is a marvel of emotional resonance and thematic coherence - a world of expression, compressed into a minute's time." N.P.R.